Chef Julie shows true grit at this year’s culinary competition. Chef Julie Marteleira Represents Leña at GMP! When the rich, savoury smell of hustle permeates the air, there’s only one thing it could be: Gold Medal Plates – the prestigious Canadian culinary competition devoted to raising money for our homegrown Olympic athletes. 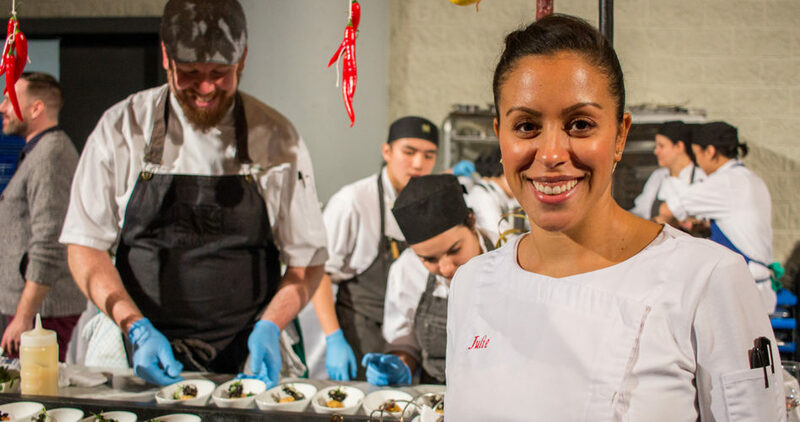 On November 16, we at Leña had the honour of supporting our incredibly talented Executive Chef, Julie Marteleira, as she competed for the regional gold medal against several of Toronto’s most notable chefs – including Chef David Lee (Nota Bene) and Chef Lorenzo Loseto (George). Chef Julie dished up an irresistibly aromatic fermented chorizo dumpling with snow crab and crispy sea urchin, which paired beautifully with Henry of Pelham’s ‘Cuvée Catharine’ Rosé Brut. Our inspiring team of culinary artists and front of house wizards showed that executing hundreds upon hundreds of palate-pleasing plates and flutes of bubbly – all with a smile – really does take a village. Congratulations to Chef Julie and to the bronze, silver and gold medalists of 2017! Scroll through the gallery above for all the delicious highlights!